I brought home a couple of rotisserie chickens last week and wanted to make some quick and easy dinners with them. I wasn't sure what I was going to make when I bought them, but I have a ton of magazines laying around with recipes for meals that include rotisserie chicken. The first one I made up all by myself :) Even made a new dipping sauce to go with! You all know how much I love my Mexican food and I was in the mood for some on this night. But I didn't want to make the whole spread with rice, beans, and a main course. Instead I settled for some finger food. One of my favorite things to order is Flautas and so I thought I'd try my hand at making them at home. And let me tell you, it was A-MAZ-ING! I will definitely be making these Flautas again. Shred the rotisserie chicken and place the meat (approx 3 - 3-1/2 cups) into a bowl. Add the rest of the ingredients and mix well. Place a flour tortilla on a paper towel or plate and place about 2 tablespoons of filling in the middle. Fold the top of the tortilla over the filling and holding it tight against the filling pull towards you until it is as far as it will go. Roll up until it is completely closed into a tube shape. Place on a plate seam side down, while you finish the rest, until ready to fry. Heat a cast iron skillet (or pan you prefer) on medium high with about 1 inch of oil in the bottom of the pan. When the oil is hot place just a couple of the flautas in the pan seam side down and do not let them roll over until they are cooked on one side. I know I did more than a few but it is easier to keep control with only 3-4 in the pan at a time. Be careful that when they start to puff around the seam that they don't unroll. I used a pair of metal tongs to keep them pressed into the pan for a few seconds. When they are golden brown on one side, about 2 - 3 minutes flip them over and cook the other side. I also tipped them up on the other two sides to get all the way around cooked evenly. 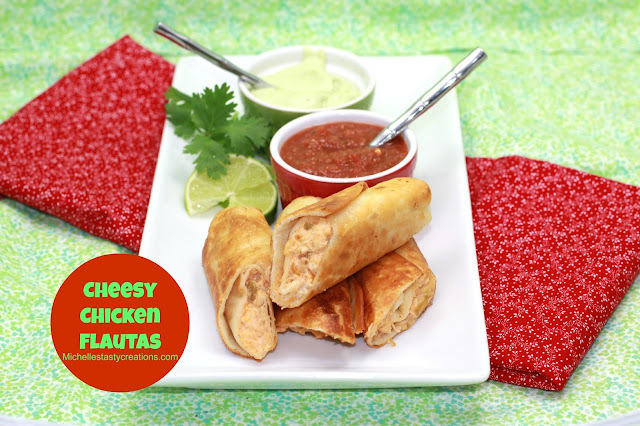 Serve with salsa, sour cream, or my Avocado Cream dipping sauce. To make the avocado cream dipping sauce place all the ingredients in a blender and blend until completely creamy. Serve with any Mexican food. Makes about 1-1/4 cups.